The first batch of class 8 students at Hunar Ghar graduated this year and 100% of them went on to get enrolled in hostel schools for secondary education. All the students who graduated this year scored 75% A and B grades in their board exams. These results are a testimony to the efficacy of pedagogical innovations employed at Hunar Ghar which are a radical shift from the traditional learning by rote practiced in most schools in rural India. Supporting rural teachers and meaningfully engaging with the community form the mainstay of these innovations. Hunar Ghar teachers Ajeet Sangia and Shantilal Bhumburia write about the efforts that have gone behind this accomplishment of our students and the teachers’ own experience of sharing this learning journey. Shantilal Bhumburia, who has been teaching Maths at Hunar Ghar since 2007, writes about how preparing for the board exams involved not just completing the syllabus but also ensuring that the children grasped the concepts well and providing them holistic support. “I have been teaching Maths at Hunar Ghar since 2007. Over the years, I have tried to share with my students everything that I have learnt through my experience and training. We all worked hard with the first batch of class 8 students to achieve excellent results. 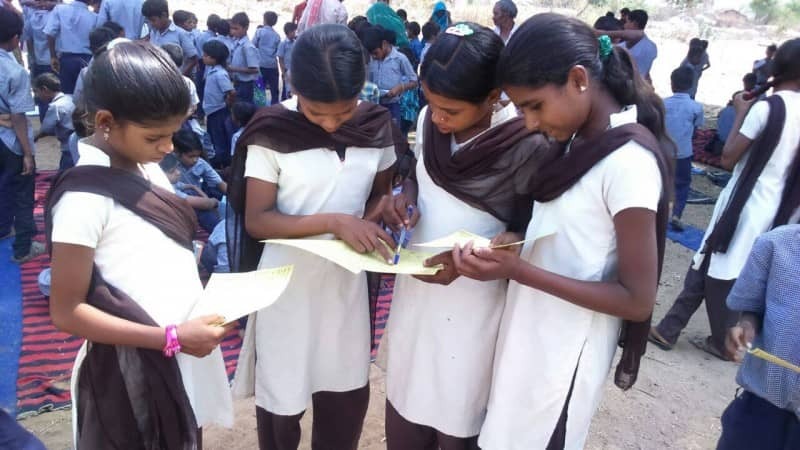 While completing the syllabus for boards, we not only helped students with techniques to solve the questions, write answers with good time management and encouraged them to attempt all the questions in the exams, we also employed practical and innovative ways to explain different concepts to children. We emphasized upon learning through observation and self-learning and had put up charts of formulae and other concepts in the classrooms. Children were taken for Community Learning Mornings and Child Learning Demonstration Days were organised. We also organised visits for our students to hospitals, forest department, grocery shops, post office, bus stand, railway station, banks and police station as part of their Project-based Summative Assessment. We met the parents weekly or sometimes twice a week to discuss about their children’s studies and whether they find enough time to study at home. This was also to ensure that the children attend school regularly. At Hunar Ghar, we teach children with a lot of love and care and try to solve their problems through detailed conversations. If I am not able to solve a problem, we discuss it together with the Headmaster and other teachers and try to resolve any difficulty faced by our students. Ajeet Sangia, who teaches Sanskrit and Hindi, shared how the excellent results of the first batch of class 8 students were a significant milestone in the journey traversed by the Hunar Ghar team. “Hunar Ghar School is located in an extremely deprived remote rural area. Providing education in this area and overcoming the day to day challenges is not an easy task. Our school is located in a community where access to education is very poor. The parents of most of our students are illiterate which makes it extremely difficult to inspire them for education. Hence, regular engagement with them and keeping in touch with them on a regular basis is important. However, looking at the board results of this first batch of class 8 graduating from Hunar Ghar, we have experienced that by putting in the right effort, excellent results can be attained anywhere whether it is an urban or a rural school. We encourage all the girls and boys who study at Hunar Ghar to continue learning and share any problem they encounter during the process of learning so that we can resolve them together. We also keep in touch with their parents regularly so that they remain involved in their children’s education and send them to school regularly. The result of these efforts has been that the children have been learning well and their board results have been the best in the entire Kotra block. Children at Hunar Ghar learn most of the things through practical learning and observation. We make weekly plans for what our children will be learning in a week so that children get the best out of their classes. The results of the first batch of class 8 students were eagerly awaited by all the teachers at Hunar Ghar and the success of our students has been the outcome of their collective efforts.